For most air travelers, the real concern isn’t crashing, being hijacked or, y’know, snakes — it’s the germ-ridden in-flight air supply. We’ve all sat next to someone with chronic flatulence, or with a sweaty hangover that could easily be mistaken for ebola symptoms, wondering if each of their coughs, sneezes and/or farts will ever leave our nostrils (or at the very least, our general vicinity). In reality, however, the air you breath on a typical flight is surprisingly clean. “Airplane air isn’t as bad as most people envision,” Charles Gerba, an environmental microbiologist at the University of Arizona, told NBC News in 2011. Gerba, also known as “Dr. Germ,” is a recognized expert on where — you guessed it — germs congregate, so if he doesn’t worry too much about the air quality on airplanes, you can probably stop, too. “On a trip, it’s more likely that the food you eat and the things you touch will make you sick,” he explained. How does the air stay clean, though? According to Boeing, “Fresh air from outside the plane is continuously drawn into the cabin through what are known as compressor stages in the jet’s engines. These stages compress the very cold and extremely thin air from outside the plane until its pressure is the same as the air in the cabin.” All the while, it passes through High-Efficiency Particulate Air HEPA filters, which remove a minimum of 99.97 percent of any airborne particulates, bacteria and viruses. In other words, despite what most people think, you’re not really breathing in the same cabin air throughout the flight — it’s filtered air from the outside. In fact, the real reason your body feels so out of whack on a flight is the dryness of the air, rather than an overabundance of passenger gas. “The overall relative humidity aboard an aluminum airplane is low — around 6 percent — and people become dehydrated on long flights if they don’t drink water regularly,” Boeing spokesperson Bret Jensen told NBC News in 2011. “This can make people feel different than when they boarded the airplane.” Considering the average humidity level in your home is 40 to 50 percent and Vegas is usually around 30 percent humidity, 6 percent will all but make your body shrivel up and die. As for a final word on the matter, know this: The average airplane’s cabin air is completely refreshed about 20 times per hour. By comparison, the air in your average office building (which is also typically HEPA-filtered) is refreshed only 12 times per hour. 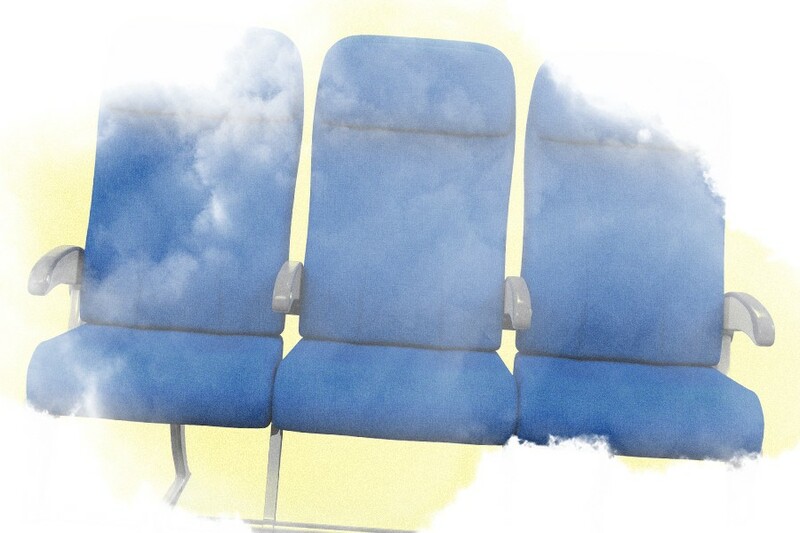 So if you’re breathing in farts anywhere, it’s not at 30,000 feet — it’s at your desk.